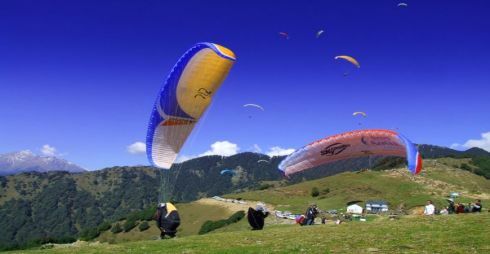 One of the major paragliding is Valley of the Dhauladhar Range in the Himalayas, (Himachal Pradesh) Bir ranks among the top flying sites in the world. With extreme possibilities for XC flying everyday, Bir has everything for every pilot, from developing your thermal-ling technique to indulging in XC flying. Bir is one of the most scenic paragliding sites one can every see. Bir,in the District of Kangra,Himachal Pradesh,is situated approximately 50 km southeast of Dharamshala at a distance of two to three hours by road. It is 14 km south of Billing, which lies on the way to the Thamsar Pass leading to Bara Bhangal. Geologically, Bir is situated in the Dhauladhar Range of the foothills of the Indian Himalayas. Pick up from Airport/Railway station in New Delhi in the morning and drive to Shimla. Upon arrival hotel check in free time and dinner at the Hotel. After breakfast proceed for leisure tour of Shimla and in and around covering The Christ Church, Shimla State Museum, Shimla Ridge and The Mall. Dinner and overnight at Hotel. After an early breakfast drive to Dharamshala. Upon arrival hotel check in. Dinner and overnight at hotel. Wake up call in the morning with tea. Have Yoga/Nature walk and comeback. Post brekfast ready for the flight to bir. Enjoy the Flight that will be about 40–50 minute. After flight proceed to your destination with unremarkable memories of Camping & paragliding in Bir-Billing with Dare Adventures. Drive to Dharamshala. Dinner and overnight at Hotel. After breakfast drive to Chandigarh. Upon arrival hotel check in. Rest of the day at leisure. Overnight at Hotel. After breakfast drive to New Delhi for onward journey. The most common cause of accidents and incidents I've seen while traveling would be scratching. Don't scratch! Almost all of the sites in Costa Rica have some glide to get to the LZ, and I always emphasize DON'T SCRATCH to my clients. Yet pilots get carried away with extending their flight, or lose track of their altitude relative to the glide needed to the LZ, and they get caught. I had 2 pilots injured last year after scratching too low. When it was too late to make it to the normal LZ they had to settle for poor landing zone options that they did not have the skills to land in safely. They both had hard landings and were injured. Unless you have very good small LZ skills, DON'T SCRATCH! Many paragliding specific landing zones are large, clear of obstacles and bordered with wind socks visible from 2000 feet over. These are great for learning and safety, but can make pilots lazy. Small LZ’s demand more skill and constant attention to changes in altitude and winds. If your LZ is large, make it artificially smaller by imagining it was the size of a soccer field or smaller. Imagine how you would approach a smaller field. A common mistake is to commit to the field too soon, flying out over the LZ before burning off sufficient altitude. Once you are over the LZ, especially a small one, your options are diminished. By definition, a small LZ has no room for more than maybe a 90 degree turn or a few S turns, so you need to lose the last bit of altitude before your final approach either in front, behind or at the side of the LZ, not over it or you will over shoot! Pick a corner and decide that’s where you will be entering the LZ on final. It should be the corner most free of obstacles for the final approach and giving the cleanest access to the LZ. Do your spirals, or lazy circles, or figure 8’s keeping an eye on the LZ for reference, then approach over your chosen corner to do the turn to final approach. Let the wing fly on final, save energy for an aggressive flair. Flapping? Can be dangerous as the chance of stall is increased, and if you need to flap it usually means your approach was poor. Don’t try it without lots of practice at a training hill with a safe (soft) landing like sand. Big ears into an LZ? Some people love it, but again don’t try it without lots of practice. Out of yes harness early? Yes, good form, better position for a PLF (parachute landing fall) if it’s needed.